Uruguay’s football team has been left toothless in the World Cup after FIFA imposed a nine-match ban on striker Luis Suarez for taking a bite out of his Italian opponent. 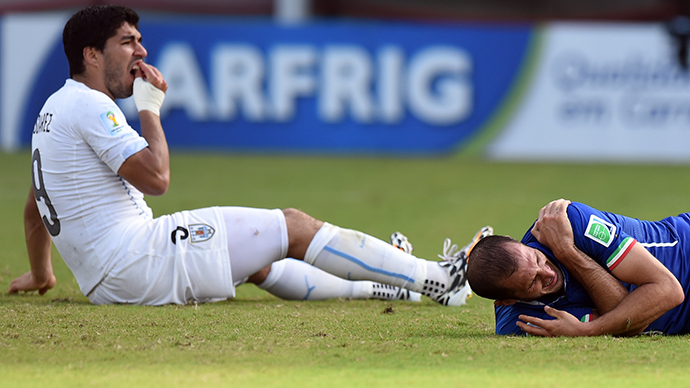 Uruguay will reportedly appeal the decision, which also comes with a large fine. 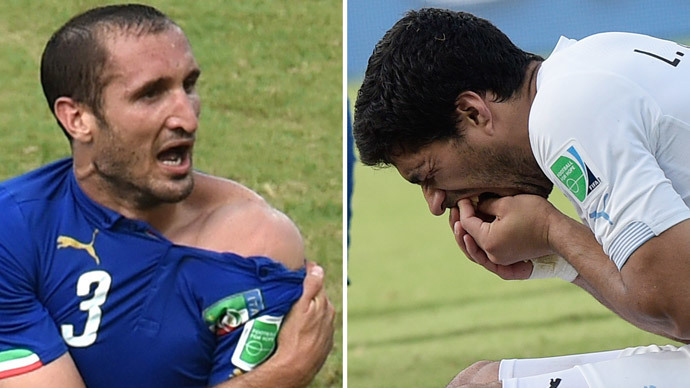 Uruguayan fans on Thursday were outraged at FIFA’s punishment for Suarez for the Tuesday incident, when the striker bit Italian defender Giorgio Chiellini’s shoulder. Uruguay’s FA vice president Jorge Barrera said they will appeal the record-breaking and harsh ban, according to local media quoted by Reuters. Suarez, who is a popular player in the Latin American country, was banned from playing for nine matches in a row, additionally suspended from any football-related activity for four months and fined 100,000 Swiss francs ($111,000). “Such behavior cannot be tolerated on any football pitch, and in particular not at a FIFA World Cup when the eyes of millions of people are on the stars on the field,” Claudio Sulser, chairman of the FIFA Disciplinary Committee, said in a statement. The striker, who scored a crucial goal in Tuesday’s game, will be unable to take part in any match during the tournament. As FIFA’s decision has come into immediate effect, he will also miss the scheduled match against Colombia in Rio de Janeiro on Saturday. The incident and FIFA’s ruling have sparked mixed reactions, with Western press joining the social media ‘trolling’ of Suarez, while Uruguayan outlets posting outraged articles, claiming the ban is too harsh and even biased. Local media have lashed out at a British-led ‘manhunt’ against Suarez, and president Jose Mujica spoke up for Suarez to be left alone. Some considered the scandal to be a European smear campaign against Uruguay and Latin American football in general. “They’re acting as if he were a criminal, a terrorist. They’re exaggerating the aggression, although I do think it warranted some sort of punishment,” 48 year-old Maria Cardozo told Reuters in Montevideo. “I don’t want to get into conspiracy theories, but it seems that FIFA isn’t interested in letting small countries such as Uruguay advance,” 62 year-old lawyer Andres Ramirez said. Meanwhile, German sportswear giant Adidas said it “fully supports FIFA’s decision,” adding that it will no longer use Suarez in 2014 FIFA World Cup marketing activities. 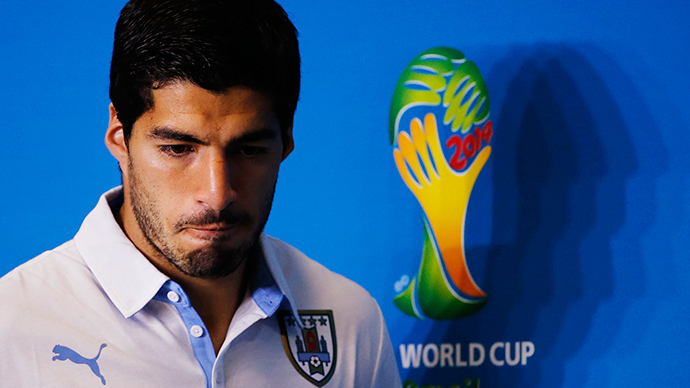 The company, however, stopped short of ending its sponsorship deal with Suarez. The ban, if upheld after appeal, will also bar Suarez from training and attending matches with England’s Liverpool at the club’s Premier League and Champions League games until late October. As a Liverpool player, the 27-year-old Suarez was voted England’s Footballer of the Year after scoring 31 league goals for the club last season. However, in the English football league the name of Suarez has also been surrounded with controversy. The striker once had to sit out eight matches for racially abusing Manchester United’s Patrice Evra, while taking a bite out of Chelsea’s Branislav Ivanovic also earned him a ban in the league.